World Cagefighting Championship has put together some memorable mixed martial arts events in the Keystone State of Pennsylvania since their debut back at 2009. 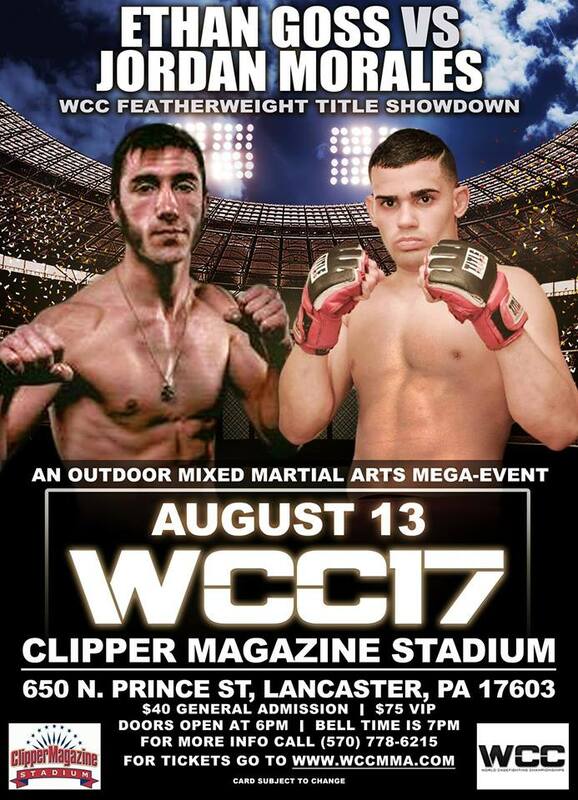 On August 13, 2016, the organization is looking to make their 17th event a historical moment by holding the event outdoors, and it is being billed as the biggest MMA event (outside of the UFC) to be held in the state at the Clipper Magazine Stadium in Lancaster. One of the featured bouts will be for the featherweight championship between Jordan Morales (5-2) and Ethan “The Wolverine” Goss (2-2). After starting off on a rocky 0-2 start in his professional MMA career, Goss “grinded” his way back to his winning ways with back-to-back wins, earning him one of the biggest opportunities in his professional mixed martial arts career to date. We had an opportunity to catch up with “The Wolverine” to discuss his upcoming August 13 fight. My MMA News: Ethan, how is your training camp going? How are you feeling? My MMA News: You have not fought for WCC since June 2013 when you fought as an amateur and the card was held in Greensburg, Pennsylvania. You had a successful fight that night submitting your opponent. How does it feel to be getting back into the cage in one of the biggest and brightest mixed martial arts organizations in the state? My MMA News: This show is going to be an outdoor stadium show. It is being billed as the biggest mixed martial arts events to ever be held in the state, outside of the UFC. How does it feel to be part of such a historic event? My MMA News: You are not only fighting on the big stage, but also for a title. You are challenging Jordan Morales for the WCC featherweight title. What do you know about your opponent and how do you see this fight going down? My MMA News: You lost your last two amateur fights and your first two professional bouts, losing a combined four fights in a row. Then you turned things around and won your next two professional fights. Did you incorporate anything different into your game plan, or can you attribute those losses to anything in particular that you are now doing differently? Goss: “As an amateur, I wasn’t looking for an undefeated record. I always went for best of the best and the toughest guys in ranks to gain experience and ready myself for the professional rankings. I was fighting for experience, and was not worried about trying to pad my record. I always want to fight the best to challenge myself. In my pro debut, I went down a weight class at bantamweight (135). The cut was decent, unfortunately I didn’t have legitimate coaching at the time. I had great training partners but I didn’t have the type of coaching where I could be constantly watched and helped out with making any adjustments. My second fight was also scheduled to be at bantamweight, but I took it on two week’s notice and couldn’t cut to 135, so we agreed on a catch weight at 140. I ended up switching coaches and am currently coached by Jason Digman. He has done an awesome job and I can’t thank him enough for all that he is doing. He is a great coach and I cant thank the staff and training partners enough for my recent success. My MMA News: Your opponent, Jordan Morales is coming off a loss. 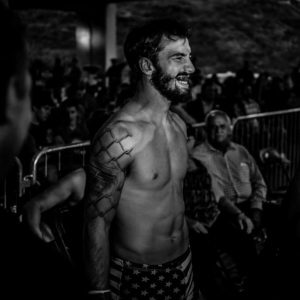 He has a 5-2 professional record, and he is also a World Cagefighting Championships Veteran. His first pro fight was with WCC. If you win this fight, you are going to become sort of a brand ambassador for the company as you will be their champion. Are you ready for the added pressure of headlining fight cards, more media obligations, fan recognition, etc? My MMA News: Lastly, before we let you go, is there anyone you want to thank? Any sponsors, family, friends, or any social media you want fans to follow you on? The floor is yours.